When members feel confident to report conduct within the organisation it indicates a robust and accountable system. Members are empowered and obliged to report any member in accordance with our values and obligations, including those under Part 13 of the Tasmania Police Manual (TPM). Members are reminded of the importance of confidentiality in all Abacus matters. Supervisors and managers are not obligated to report breaches of the Code of Conduct for IRM1s. These matters may be registered on BlueTeam by either the reporting member or the senior officer. Even if not registered on BlueTeam the senior officer is to ensure the matter is managed appropriately. If it is an IRM1 but involves repeated behaviours then it must be reported formally through BlueTeam. It is important to deal with such issues in a timely manner and to ensure that CPD occurs as necessary. Constable J’s dress and appearance does not comply with the standards set by the Commissioner as she has her hair in a ponytail. Sergeant Q speaks to Constable J in relation to ensuring her hair does not extend beyond the top of the collar. Constable J apologises and undertakes to remedy the matter. As this is an IRM1 and there has been no previous issue with Constable J, Sergeant Q does not need to report the matter on BlueTeam™. Constable N is a highly-motivated member. He enjoys being ‘out amongst it’ and has a very high work ethic. Unfortunately, he is tardy in submitting his paperwork. He has been spoken to about the importance of finalising his reports in a timely manner – but has not improved. Sergeant Z is aware that, if this were a one-off, it could be an IRM1. As it is repeated conduct it must be an IRM2 and be formally reported. Any victimisation of police complainants will not be tolerated. Such behaviour constitutes a breach of section 42(12) of the Police Service Act 2003. Any member becoming aware of victimising conduct must either register it on BlueTeam™ as a new matter, or report it to a senior officer. Failure to comply with this will undermine the entire system. In this instance, the reporting member can choose to make the report anonymously. This can be done in a variety of ways – irrespective, the member will need to keep a record of when, where and how the matter was reported. This is essential should the member be required to demonstrate that they have complied with the TPM obligation to report a member breaching the Code of Conduct. Comprehensive public interest disclosure information for members (including the Public Interest Disclosures Lodgement Form) is available on the Tasmania Police public website. A ‘protected disclosure’ is a report that is made in accordance with Part 2 of the Public Interest Disclosure Act 2002 and may attract protections which are given by Part 3 of the Public Interest Disclosure Act 2002 if it meets the threshold tests. It can be made by any means and may be anonymous. It is a report made from within Tasmania Police to the Commissioner about improper or corrupt conduct or maladministration (see below for further explanation). Any disclosures under the Public Interest Disclosure Act 2002 may or may not be handled as an Abacus investigation. Due to the protections provided, including anonymity provisions, these matters can be reported in many ways and do not have to be registered on BlueTeam. Disclosures can be made to the Protected Disclosure Coordinator (the Deputy Commissioner), the Commissioner, or Ombudsman Tasmania. Disclosures may be made by members, or by Department of Fire, Police and Emergency Management (DPFEM) employees, contractors or former contractors. Disclosures relating to the Commissioner are to be made to Ombudsman Tasmania. These procedures are designed to complement normal communication channels between supervisors and members. Members are encouraged to continue to raise matters at any time with their supervisors. conduct that constitutes detrimental action against a person who makes a public interest disclosure under this Act – that is serious or significant as determined in accordance with guidelines issued by the Ombudsman Tasmania. a conspiracy or attempt to engage in conduct referred to in paragraph (a), (b), (c) or (d). Further information on improper conduct is provided by Ombudsman Tasmania in their Guidelines and Standards for the Purpose of Determining whether Improper Conduct is Serious or Significant (No. 1/2010). Members should have the confidence to voluntarily disclose any matter relating to their own conduct. 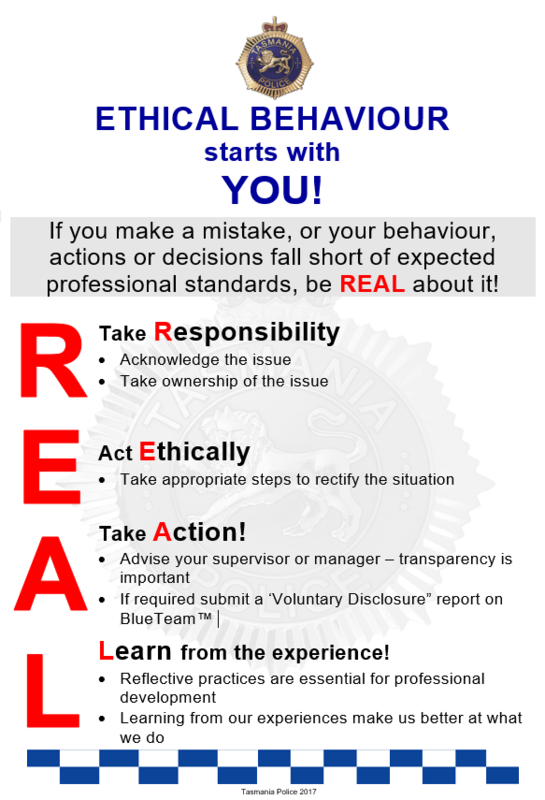 When mistakes are made or behaviour, actions or decisions fall short of expected professional standards, members are encouraged to be REAL about it. Problems are best resolved if declared at the earliest time and this is in everybody’s interest, not least the member involved. Furthermore, it demonstrates a commitment to our oath / affirmation and values. The method of reporting voluntary disclosures is through a Voluntary Disclosure Report on BlueTeam. A manager receiving a voluntary disclosure is to recategorise the matter as appropriate. In deciding managerial resolution (level 1 matters) or determination under section 43(3) of the Police Service Act 2003 (level 2 and 3 matters), due credit must be given to the member for making the disclosure voluntarily. Depending on the seriousness of a matter, decisions on whether or not to issue a Determination Notice may be influenced by the fact that a member has voluntarily disclosed it. The procedures and orders under Part 2.5.3 of the TPM apply whenever members attend a family violence incident involving another member; or receive a family violence complaint against another member. Members of Tasmania Police will be treated in the same manner as members of the public. All incidents will be recorded on the Family Violence Management System. Members who are issued with any order as the result of family violence who are in possession of any firearm, police issued or otherwise, shall immediately surrender that firearm, and may not resume possession of the firearm for the duration of the order. Any application to vary any order involving members of Tasmania Police, which involves the variation or removal of the firearm condition, is to be made before a court of petty sessions. When Tasmania Police receives a report of family violence involving a Tasmania Police member, a Sergeant will attend the incident. the relevant Divisional Inspector is nominated as the validating supervisor for the FVMS report. If the matter is deemed to be a family violence incident, the attending Sergeant will seek the immediate attendance of a Duty or Divisional Inspector and fully brief them. ensure the matter is registered on BlueTeam. Where no offence, serious offence or crime is alleged, the BlueTeam entry is to be an ‘Information Only’ and the incident summary should contain a reference to the FVMS number. The FVMS will be the case management system for the matter. ensure the District Commander is notified as soon as practicable. ensure the BlueTeam entry is registered as a level 2 or 3 matter (noting that no Offence Report is required). If a complaint exists, it is to be categorised as a complaint 2 or 3. If no complaint exists it is to be categorised as an IRM2 or 3.
liaise with the Commander, Professional Standards regarding allocation of the matter for inquiry or investigation (either to the relevant district or to Professional Standards). In cases where Professional Standards has immediate carriage of a matter they will make for, or oversee any applications for, a PFVO, IFVO or FVO. Any arrest of a member should be conducted by the attending Inspector, unless it is necessary in the circumstances to arrest the member immediately for the protection of any victim or affected child. In such case, all members are duty-bound to make the arrest. any access to police firearms storage must be prohibited (key surrendered / code changed / swipe card disengaged). Where there is an allegation of an offence, serious offence or crime against a member of Tasmania Police, attending members are to secure evidence in the first instance in accordance with standard crime scene attendance procedures. Witness statements and associated enquiries may be required to be taken by attending members. If Professional Standards is likely to have carriage of a matter, they should be consulted about task allocation in securing and collecting evidence. Where photographs or electronic evidence is required by Forensic Services, there is no change to standard procedure, except that photographs of intimate body parts will not be uploaded to the Forensic Register. In such case, advice must be sought from Professional Standards. Allegations of family violence need to be assessed on a case-by-case basis in relation to potential breaches of the Code of Conduct. The following reports are required when a family violence incident occurs that involves a police officer. Breaches of the TPM and other Tasmania Police or DPFEM policies are reported on BlueTeam™ as internally raised matters (IRMs). Examples include breaches of the Commissioner’s Directions for Alcohol and Drug Testing, informant management procedures and information security policies. This section applies to incidents involving on-duty and off-duty members who return a positive roadside breath test or positive oral fluid test. It is essential that in this situation the intercepting members understand their primary duty is to the law and their secondary duty is to other members’ welfare. The intercepting members must ensure that all legal obligations (e.g. breath analysis) are complied with in the first instance. As with any other offence, members are not to be treated differently to any other person. Below are the steps to be followed in different situations. and routes the entry to their supervisor and standard Abacus processes follow. Professional Standards and the District Commander are to be notified. If the breath analysis is below the prescribed concentration of alcohol and the member is off-duty there is no BlueTeam entry. If the breath analysis is below the prescribed concentration of alcohol and the member is on-duty then a BlueTeam entry is to be made (for any reading). Consideration is then to be given to further testing under the Commissioner’s Directions for Alcohol and Drug Testing. If the member is on-duty then a BlueTeam™ entry is to be made. Consideration is then to be given to further testing under the Commissioner’s Directions for Alcohol and Drug Testing. The actions outlined in this framework are indicative only. 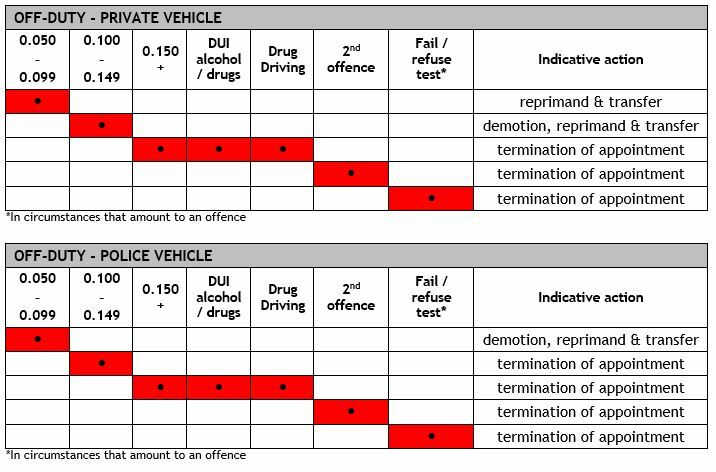 The framework is intended as a guide to indicate the likely actions in the event that a member is detected drink driving or drug driving. Actions are not limited to those listed in this section. Consideration may be given to a broad range of options which include section 43(3) Actions or removal or limitation from higher duties or internal / external courses. Regardless of the indicated actions the Commissioner has the authority to determine what action will be taken including, in serious cases, termination of appointment. Members’ rights of appeal to the Police Review Board do not change. Where demotion is an indicated action, a reduction in remuneration may be considered in the alternative depending on all relevant circumstances and considerations. Where the member is on or near the base level of remuneration, an alternative action may be considered. In a training and educational setting learning involves a genuine change in knowledge, skills and attitudes and requires ethical behaviour and hard work. Training includes vocational knowledge, skills and attitudes; and education and personal development includes tertiary qualifications, conceptual and analytical skills. Plagiarism is associated with any formal written work which is accompanied by a set of instructions and is assessed (e.g., essays, syndicate and individual assignments, research projects, in-tray reports). inadequate research skills, such as not keeping correct details of sources of information and/or direct quotes. The practice of deception and acting unfairly or fraudulently. Within the police education and training environment, cheating refers to academic misconduct which occurs during written examinations and practical assessments. Acting with another person with the intention to deceive. This form of deception relates to when a person uses work that someone else has done previously as their own, either in full or in part, and with the original author’s permission. It can also include another person writing any part of a student’s work / assignment. Collusion should not be confused with the sharing of ideas and information with others in a learning environment. The crucial aspect is that those ideas are not copied verbatim. Academic misconduct does not allow learning to occur. Plagiarism, cheating and collusion are all forms of intellectual theft and breach a number of provisions of the Code of Conduct: including the requirements to act with honesty and integrity, and care and diligence. The Advice to Students on Academic Misconduct provides guidance on avoiding academic misconduct; information and procedures about TURNITIN software for detecting plagiarism and collusion. Members should be aware that if an educational institution detects Academic Misconduct (e.g. the University of Tasmania), they will inform Tasmania Police of the circumstance. If the Academic Misconduct is identified by Tasmania Police, Tasmania Police will notify the educational institution. Tasmania Police acknowledges that the educational institution will take action in accordance with their Ordinances. determination that the member is ineligible to sit examinations, undertake or continue a course or qualification process for a nominated period. Members should also be mindful that any suggestion of academic misconduct will be investigated internally and that there may be additional consequences for breaches of the code of conduct over and above academic penalties. Allegations of academic misconduct must be registered on BlueTeam as IRMs. Procedural fairness principles and members’ rights and obligations apply to allegations of academic misconduct, as with any other Abacus matter. The standard procedure for categorisation also applies and the appropriate level must be selected (IRM2 or IRM3). After reaching the IAPro ‘holding bin’ they will be allocated to a manager within the Education and Training Command or to Professional Standards. s42(1) A police officer must behave honestly and with integrity in the course of his or her duties in the Police Service. s42(2) A police officer must act with care and diligence in the course of his or her duties in the Police Service. s42(7) A police officer, in connection with his or her duties in the Police Service, must not – (a) knowingly provide false or misleading information; or (b) omit to provide any matter knowing that without that matter the information is misleading. Where it is determined that a member has breached the Code of Conduct action may be taken under section 43(3) of the Police Service Act 2003. Recording these incidents centrally on BlueTeam™ offers a streamlined, clearer reporting process for members; and case management capability. It assists in identifying organisational learning and individual professional development needs through data analysis. Compliance review is essential for community confidence and is consistent with the Tasmania Police values. The remainder of this chapter describes the various types of Abacus compliance review matters (unless they have been described elsewhere). Police are endowed with many powers of coercion and control under various legislation and members are highly accountable for the exercising of those powers. If members do not abide by legislation and policies relating to these powers they may be prosecuted. a less-lethal weapon/impact/takedown technique is used on a person. Where a UOFR is required to be submitted in accordance with Part 10 of the TPM, members must register the matter on BlueTeam™. The Guide to Entering and Forwarding Electronic Use of Force Reports is available on the intranet and provides an easy to follow template for reporting. Part 10 of the TPM further states that all UOFR are checked by divisional inspectors. This process ensures accountability and organisational learning – divisional inspectors must determine or comment on adherence to policy and orders; effectiveness and clarity of policy; and training deficiencies. The Operational Skills Unit monitors all UOFRs to ensure that the application of force and the tactical force options used by members are appropriate and consistent with policy. Some UOFRs may be identified as requiring further scrutiny. Where compliance with policy has not occurred, it must be registered on BlueTeam™ as an internally raised matter (IRM) by the divisional inspector or the inspector with responsibility for the Operational Skills Unit. A person is justified in using, in the defence of himself or another person, such force as, in the circumstances as he believes them to be, it is reasonable to use. Part 1.44 of the TPM (Use of Force) states that members are justified in using reasonable force in defence of themselves or any other person. Members must only use force that is reasonable, necessary, proportionate and appropriate to the circumstances. In determining whether or not force used is reasonable or otherwise, the inquirer / investigator and authoriser will be required to consider the circumstances both objectively and subjectively. Members who are the subject of a complaint or UOFR resulting in a level 2 or 3 inquiry or investigation may be found to have breached one or more provisions of the Code of Conduct. Consequently they may receive a Determination Notice and section 43(3) Action in accordance with Abacus. They may also be charged with an offence such as common assault. 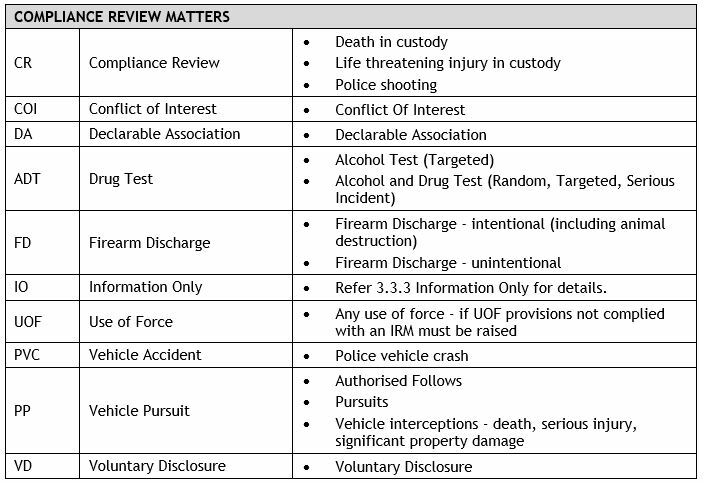 Professional Standards will manage the investigation process and register a Compliance Review report on IAPro which will be linked to the UOFR and Firearm Discharge report in IAPro. Members are directed to Part 10.9 of the TPM for further reporting obligations. during police action where members did not have close contact with the person as to be able to significantly influence or control the person’s behaviour. These situations include, but are not limited to, sieges, a person committing suicide during police negotiations, and incidents where the member(s) were attempting to apprehend a person (e.g. pursuits). Professional Standards will notify the Integrity Commission in writing as soon as possible following any incident that results in a death or life-threatening injury for accountability reasons, however the Integrity Commission has no role in any compliance review process. The Management of Police Pursuits and Authorised Follows are described fully in Part 14.14 of the TPM. Pursuits are categorised at three levels, Pursuit 1, Pursuit 2 and Pursuit 3. The obligations of members, supervisors and managers in relation to police vehicle crashes are contained within Part 3.8.5 of the TPM. All police vehicle crashes are to be recorded on the Traffic Crash Reporting System. They are also to be entered in to BlueTeam. All related documents and reports are to be attached and the matter referred to the responsible manager for review and routing to Professional Standards. Professional Standards will release it from the IAPro ‘holding bin’ and then refer the Police Vehicle Crash report back to the District for finalisation. In some circumstances Professional Standards may be required to undertake the investigation (e.g. pursuit 3 related crash). The Commissioner’s Directions for Alcohol and Drug Testing fully describe the obligations of members, supervisors and managers in relation to alcohol and drug testing conducted under the provisions of Division 4 (Alcohol and Drugs) of the Police Service Act 2003. Alcohol and drug testing can be random, targeted or serious incident related. It is conducted by an independent service provider. All alcohol and drug tests are recorded on IAPro. This page -- https://www.police.tas.gov.au/about-us/abacus/4-internally-raised-matters-compliance-review/ -- was last published on March 1, 2018 by the Department of Police, Fire and Emergency Management.